We love SnapEngage, and so do our users. It gives them a warm, fuzzy feeling to be able to get their question answered right away, and it gives us the opportunity to put a personal touch on our support. Wouldn’t trade it. However, chatting with folks can take up a lot of time, and we tend to get the same few questions over and over. The top 10 questions probably take 90% of our support time. We put these in an FAQ page, but people will still click that big green “Live Support” button without checking the FAQ page (I know I would), and we’ll still have to spend support time pointing them to the right question. We’re using setTimeout() so the code doesn’t execute immediately. 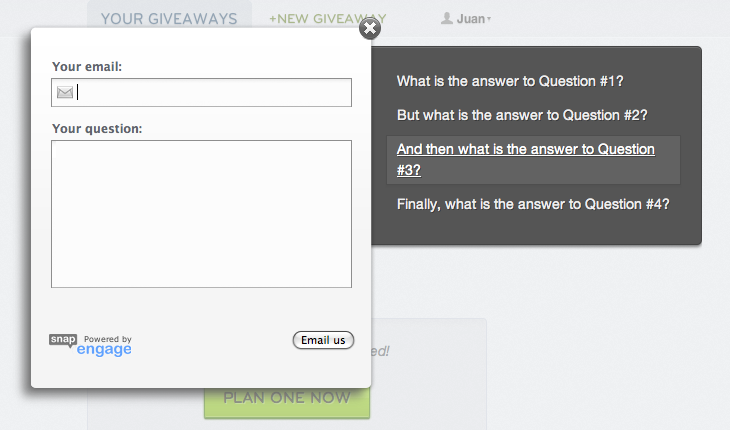 This gives us a slight delay between the time the chat widget is rendered and the time we show the FAQ’s. It’s a nice little trick to draw attention to them without being obnoxious. We animate (“slide out”) the list for the same reason: it’s a subtle way to draw attention. We’re using jQuery Easing for nice, smooth animations. The rest of the CSS (that makes it all fancy-like) is too long to embed here, but it’s on GitHub. Feel free to totally steal it. Sweet! I’d love to hear any thoughts you have on the approach or how it could be better. Haha, thanks Jerome. It turned out alright. It’s definitely hacky, but it works :) – SnapEngage is sweet! Awesome, I’m glad it helped you out :) – Shoot me an email at jr@raffleocpter.com and we’ll see about getting you hooked up with an invite.